ZStack's system testing system runs test cases in real hardware environment; like integration testing, the system testing is full automated and covers aspects of functional tests, stress tests, and performance tests. Despite the integration testing system we introduced in The Automation Testing System 1: Integration Testing is powerful to expose a large proportion of bugs in the development process, it has inherent weaknesses. First, as the test cases use simulators, they cannot test real scenarios, for example, testing creating a VM on a physical KVM host. Second, the integration test cases focus on testing a single scenario in a simple, artificial environment; for example, still the creating VM case, it may only deploy a minimal environment having one host, one L3 network that just meets the requirement for creating a VM. These weaknesses, however, are deliberate because we want developers can quickly and easily write cases when they develop a new feature, it's a tradeoff we have to take. Complex scenario: scenarios should be more complex than the real world use cases, to test limits of the software. For example, the attaching/detaching volume case will continuously and repeatedly attach/detach volumes to VMs in a very fast manner that humans cannot do with their hands. Easy to write and maintain test cases: just like integration testing system, the system testing system takes over most boring, repeating tasks from testers, letting testers write cases efficiently. Testing Framework: a framework managing all test cases and providing necessary libraries, utilities. Environment deploying tool: a tool that can deploy an environment from XML configuration file; it's very similar to the Deployer in integration testing system. Modularized test cases: test cases are highly modularized and are covering functional test, performance test, and stress test. 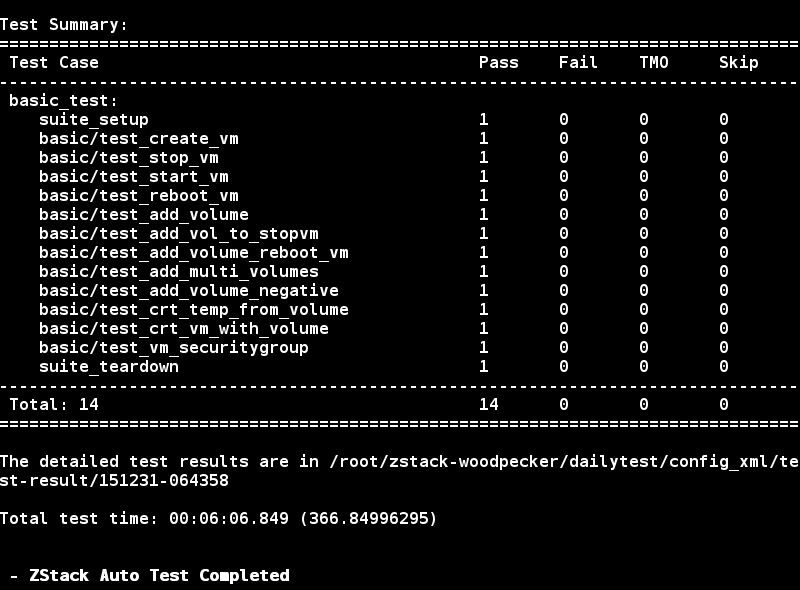 zstack-woodpecker is created all by ourselves; before deciding to reinvent the wheel, we tried popular Python testing frameworks like nose and finally selected to create a new tool that fits our interests best. Readers with sharp eyes may have noticed some parameters that are not seen in other testing frameworks. The first one is the timeout; every test case can define its timeout and if it cannot finish in the period it will be marked as timeout in the final result. The second one is repeat that allows you to specify how many times the case should run within the suite. 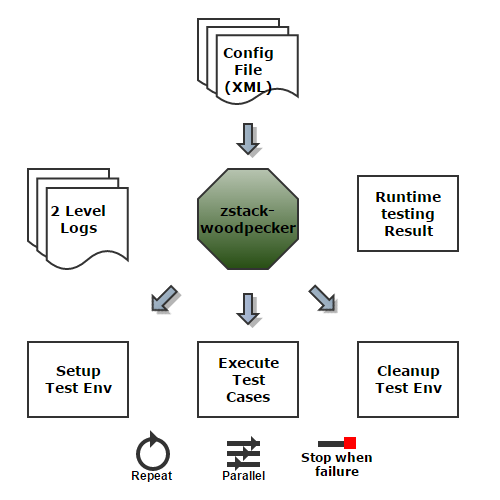 The third one that is also the killer one is parallel that allows tester to set the parallelism level of the suite; this is the key feature that makes zstack-woodpecker runs test cases very fast; in the above example the parallel is set to 8, that means there will be at most 8 cases running simultaneously; this not only speeds up running cases but also creates a complex scenario that simulates users carrying out different tasks sharing the same environment. However, not all cases can be executed simultaneously; in our example the case test_delete_l2.py will delete L2 networks on which are relied by other cases, so it cannot be executed while other cases are running; this is the situation that the fourth parameter noparallel plays its role; once it's set to True, the case will be executed lonely and no other cases can run at the same time. zstest.py is a command line tool that helps testers control the testing framework, doing jobs like starting test suite, listing test cases and so forth. 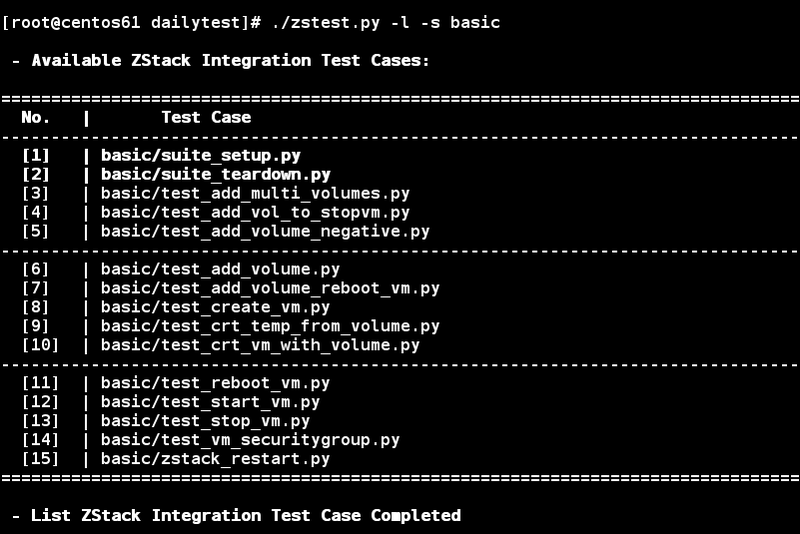 zstest.py provides plenty of options assisting testers simplifying their work. A couple of options, which we use in our daily testing, are particular useful as follows. remember you need to run the suite setup case suite_setup.py as the first case, unless you have done it manually. <l2VlanNetwork name="$l2VlanNetworkName1" description="guest l2 vlan network"
Note: As you may have guessed, the tool can be used for administrators to deploy a cloud from the XML configuration; and what's more, administrators can do the reverse that dumps a cloud into XML file by zstack-cli -D xml-file-name. <cluster name="$clusterName_sim" description="10 same Simulator Clusters" duplication="10"
<host name="$hostName_sim" description="100 same simulator Test Host"
In the above example, 100 zones, 1000 cluster (100 zones with 10 clusters in each), and 100,000 hosts (1000 cluster with 100 hosts in each) will be created. It saves testers a lot of efforts in preparing an environment for complex performance and stress test. zstack-woodpecker itself provides a comprehensive library helping testers conduct those activities; APIs are well wrapped in a library automatically generated from ZStack source code; testers don't need to write any raw API call. 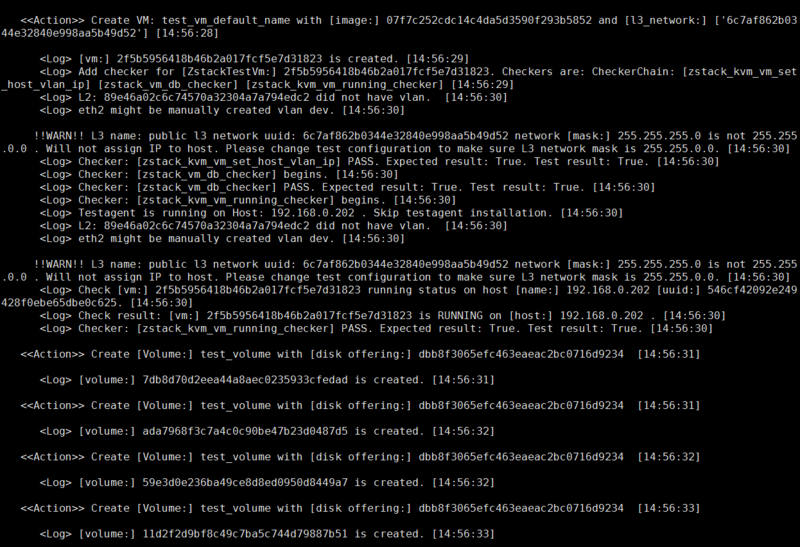 Checkers, which validate test results, are also created for every resource; for example, VM checker, volume checker; testers can easily call those checkers to validate resources they have created without writing tons of lines code; if current checkers cannot satisfy certain situation, testers can also create their own checkers and plug them into the testing framework. Like the integration testing, testers can work out a case with only tens of lines code. The modularity not only helps simplify writing test cases, but also develops a solid base for Model-based testing that we will elaborate in the next article. In this article, we introduced our system testing system. By doing more complex tests than real world use cases, the system testing gives us much confidence that how ZStack will perform in real hardware environment, which lets us be able to evolve quickly to a mature product.